Through a connection that we made on the Mountain Lodges of Peru trip to Machu Picchu, Ted was able to arrange a fabulous 3 day/2 night stay on the private island of Isla Suasi. Isla Suasi is an incredibly small, yet spectacularly beautiful island on the northeast end of Lake Titicaca. The hotel is the only building on the island besides the island owner’s private residence. It is exclusive, it is luxurious, and it was a treat! Upon arriving by boat, we were served an amazing Andean barbeque lunch overlooking the beautiful blue water. That afternoon, and in fact throughout the stay, you could do as much or as little as you wanted. Activities options included: walking to the highest point of the island to watch the sunset, visiting the eucalyptus steam room, drinking wine and reading a book, kayaking around the island, taking a tour of the island’s owner’s home/museum, star-gazing, etc. Ted and I took the opportunity to kayak around the island and we had such a great time doing it that we decided to do it again the next day! In general we relaxed, enjoyed the incredibly delicious food and the wonderfully helpful staff, and slept well in a our fantastic room. The contrast between our homestay on the island of Amantani(where Ted had to show me how to “flush” a toilet with a bucket of water), and the five-star treatment and facilities that we experienced on Isla Suasi was certainly striking. However, as both types experiences are exceptions to our normal way of traveling, it reminds us to be thankful for what we normally may take for granted as well as to appreciate good fortune when we have the opportunity! Through Ted and I mostly have an open itinerary, we do have a few planned trips thanks to our good friends at Adventures Within Reach (AWR). AWR is a Boulder-based tour operator that we are working with while on our journey. 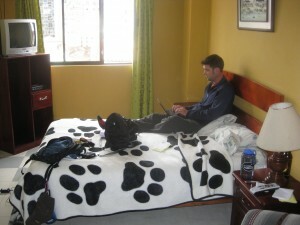 It’s a pretty amazing “job” actually – AWR needs detailed information about different treks, hotels, and operators in some of the areas we are visiting, and we are happy to test, research, and report on them as it allows us access to some amazing adventures that would normally be out of our price range. If you’re thinking about a trip to S. America, Africa, or Nepal, you should check out their website. We’ve really been impressed, as you’ll see below. Our first such trip arranged with AWR’s assistance was the Salkantay Trek to Machu Picchu with Mountain Lodges of Peru (MLP). The most popular trek to Machu Picchu is the famous “Inca Trail”, but due to its immense popularity, limits have been imposed on daily access (500 people per day – needless to say, the trail is crowded). In reality, there are many Inca trails in the region, and some of these alternative treks provide equally stunning scenery, and a much more private atmosphere. The Salkantay is one of these treks. We knew ahead of time that the MLP trip would be fancy, but we really had no idea what we were in for. The 8-day trip was the most fantastic that either Ted or I have ever been on. We emailed our parents that we felt like we were on our second honeymoon! Anyone who is considering a trek to Machu Picchu that wants a “comfortable” experience should seriously consider the MLP trip. Hands-down amazing! As I mentioned above, there are many different hikes that get you to Machu Picchu and most of these involve rather long days of hiking and then camping each night. The other companies usually make the trip in 3-4 days. The MLP trip is different, not only because they spread out the 24 miles of hiking over 6 days, but you get to spend each night in incredible lodges (with hot tubs! ), eating beautifully-presented, wonderfully-delicious meals. In addition, the staff and guides provide over-the-top service and think of every last detail to spoil you rotten (why yes, I would love a cool towel and a glass of fresh fruit juice after my long day of hiking). -Our first view of the Humantay Glacier. There we were walking along on our first day of the trek and then we rounded the corner to see the most beautiful glacier-covered mountain peak. -The view from the hot tub at the first lodge (with the Salkantay Glacier and Humantay Glacier in the distance). -The highest we’ve ever been! The pass on our third day of hiking took us over 15,000 feet! Ted and I have done a few 14ers (14,000 foot peaks) in Colorado, but this was certainly our first 15er. -Wayra Lodge – the second lodge we stayed in our trek. It has to be situated in one of the most beautiful places in the world. And, it’s only accessible by foot – no roads! -The food. Peruvian food has been impressive nation-wide, but food we had on this trip was truly gourmet. We’ve never taken so many pictures of food in our lives. They were absolutely works of art. -Our great group. We got to meet fun, unique people that are also in the travel industry. We were also lucky to have amazing guides and be accompanied by two cool MLP office staff members. You spend a LOT of time with your group, and we are certain that they were part of the reason we had so much fun. -Oh, and by the way, did I mention it culminates at Machu Picchu, the most amazing historic site on the planet! More on this soon! So if you can’t tell, we absolutely loved the trip and would do it again tomorrow. It was literally the first thing we did upon arriving in Peru and it certainly set the stage for the amazing time we were going to have in this country. More pictures? Check out the full MLP album here. I love this place! Owned by an American couple that has been living here and running the Inn since, 1996, this special place is way-off the beaten track but they certainly reward you once you get here. After 8 hours on two different buses, we were happily walking up the driveway and were warmly welcomed by Andres and his partner Michelle. Ted was aware of this place because of his work with Sustainable Travel International. The Black Sheep Inn is one of their members and they have also been honored repeatedly in the travel industry for their commitment to the environment and the local community. I’ll let Ted write more about their initiatives and accomplishments in another post, but know that they’ve gone over the top (in a good way) with everything from composting toilets to solar-powered water pumps. Accommodations for up to 35 people – including a dormitory-style bunkhouse, private doubles with shared baths as well private rooms with private baths. A sauna and hot pool. The heat emitted from the sauna heats the water in the pool. It’s not a proper jacuzzi, but it made our day and kept us warm enough! As well as many fun extras like a volleyball court, darts, a zip line, a water slide and a frisbee golf course! We’ve also had the pleasure to meet other travelers from around the world. Last night we had dinner with an Ecuadorian woman and her young daughter; a couple from the Czech republic; an American ex-pat and his girlfriend who is originally from Taiwan but has been living in Ecuador for 20+ years; a American guy from San Diego traveling alone and two women from San Francisco. What a treat! Today we went hiking with the guy from San Diego and the women from San Francisco – amazing pictures and details from that hike to come! Andres and Michelle have thought of everything and know how to cater to a Western tourists needs and desires – as they are gringos themselves! Though we loved our community homestay experiences these past couple weeks, it’s a welcomed treat to have a few over-the-top extras in our life these next few days. In fact, we just changed our two-night reservation to 3 nights. Needless to say, I’m thrilled. 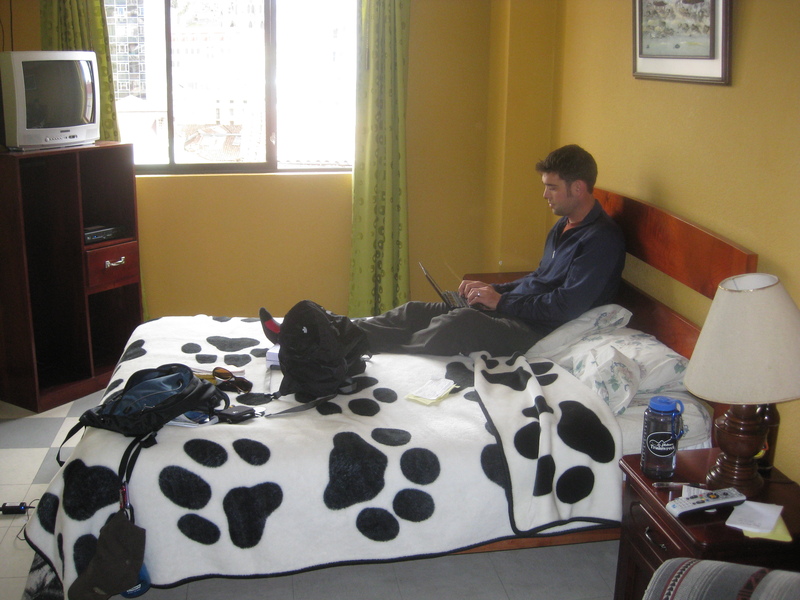 In planning for our trip I booked two nights in a hostel in Quito so we would have somewhere to stay when we first arrived. I remember when booking online how excited I was to learn that our ‘Deluxe Private Double’ would be a whopping $26/night. Not sure exactly what you’re going to get when you book online, we were pleasantly surprised/relieved to learn that our little room had a double bed, a nice-sized private bath (with hot water), and a cable TV. Our hostel also has an amazing terrace overlooking the city and a welcoming lobby full of fellow travelers, day-trip information, computers, etc. Not bad at all. In addition, the hostel is run by a lovely couple that does everything from changing the sheets and making breakfast to calling the airlines to help travelers find their lost luggage (see previous post!). In addition to cheap lodging, our meals here (we’ve only had two so far!) have each been at total of $3. Yep, $3 for coffee, a croissant, an egg and a fruit cup for each of us. And $3 for arroz con pollo (rice with chicken, beans and plantain) and sopa de cameron (soup with shrimp and potatoes). I’m sure there will be plenty of opportunities to spend well beyond these reasonable prices, but it’s good to know that we can sleep comfortably and eat deliciously and remain well within our budget.